The life-sized terracotta warriors of China are known throughout the world. This clay army of 8,000 including infantry, archers, generals and cavalry was discovered by archaeologists in 1974 after farmers digging a well near the Chinese city of Xian unearthed pieces of clay sculpted in human form. An amazing archaeological find, the terracotta warriors date back more than two thousand years. But what was the purpose of this army of clay soldiers? Who ordered its construction? How were they created? Secrets of the Dead investigates the story behind China’s Terracotta Warriors and documents their return to former glory for the first time. The film premieres nationally Wednesday, May 4 at 8 p.m. on PBS (check local listings). More than 2000 years ago, the first emperor of China set out to build a lavish tomb where he could spend his eternal life. The emperor needed fierce warriors to accompany him into the afterlife, to protect him from the unknown. 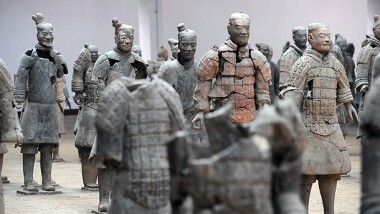 And so, to satisfy their leader’s wish, ancient Chinese craftsmen created an army of clay, 8,000 soldiers strong. Now, 21st-century scientists are studying the terracotta warriors and making astonishing discoveries. In Mexico, the city of Teotihaucan is expanding ... On track to become ancient America’s greatest metropolis. In Egypt, the city of Alexandria boasts a 400-foot-tall lighthouse ... (one of the tallest buildings in the world, at the time). ... And in China, a team of craftsmen begins an incredible feat. More than two thousand years later ... In 1974 ... Farmers digging a well near the Chinese city of Xian discovered strange fragments of clay sculpted in human form. Intrigued, Chinese archaeologists carefully excavated the soil and made a staggering discovery. Near the tomb of one of history’s most powerful men. The brilliant soldier and ruthless conqueror named Qin Shihuangdi. And he built himself an extraordinary tomb, one that dwarfed the ancient Egyptian pharaoh’s pyramids. Its rivers and oceans made of mercury, its replicas of palaces, fully reproducing the emperor’s earthly realm. But there was no mention of an underground army in this ancient text. And nothing like it had ever been found, before or since. The origins of the terra cotta warriors have remained a mystery for more than two millennia. Now, archaeologists and scientists from around the world have joined together to find out everything they can about the statues—why they were made and perhaps more intriguingly, how they were made. Each soldier stands six feet tall and weighs more than 600 pounds. Creating the terra cotta warriors was a stunning achievement. They would have cost a fortune only an emperor could afford. The task would have required years of work ... And endless ingenuity ... As workers struggled to make clay statues on a scale never attempted before. And when they were finally finished, they were buried out of sight for eternity. Qin Shihuangdi went to enormous trouble and expense to create these statues. Statues that would never be seen by human eyes after his death. Just west of the first emperor’s tomb, archaelogist Jing Honwei is studying another royal tomb. One that might provide clues to understanding why the first emperor produced his army of clay. This gigantic pit was the tomb of Qin Jing Gong ... Ruler of the small kingdom of Qin ... And one of the first emperor’s ancestors. These wooden boxes are grim reminders of what happened here on the day Qin was buried ... The ritual killing of his entire court. When Qin Jing Gong passed away, he buried 186 living people with him. ... They were buried in these coffins. Each coffin was numbered, and each victim was also given a number. Every victim was buried in the coffin with his or her number. The position of every coffin had been preassigned. Pride of place went to the ruler’s ministers and wives, assigned to the coffins nearest his own. Cruder caskets in the outer ranks held royal craftsmen, bodyguards, and other useful commoners. They were all killed to serve their lord in death, as they had in life. It is the largest human sacrifice ever found in an ancient Chinese tomb. Almost every big tomb would have 100 to 200 corpses. This is a massive number. Body counts like these from royal tombs conjure up images of mass slaughter. But there’s no evidence of a violent massacre. These bones belong to people buried in Qin Jing Gong’s tomb. And according to archaeologist Zhang Zhongli, some of these people were happy ... Or at least willing ... To die. At that time, people believed that there was another world where people could carry on their lives after death ... Rulers’ attendants and followers were enjoying their lives with their masters when he was alive. So it was quite natural to follow him when he died ... For them, death was another form of life. Some people were terrified and unwilling to die. But some other people thought their lives were meaningless without their master, so they wanted to follow their master to death, and considered this as a big honor. Some committed suicide, others were murdered. The answer to how they died lies in the bones. This is a ... Human skull uncovered from a coffin in the tomb. We tested the chemical composition of the skull and hair and found that they both contained arsenic. There are no traces of arsenic in the ground around the coffins ... which leaves only one possibility. The arsenic must have been ingested by the victims – voluntarily or not. Arsenic can be dissolved in alcohol. So we think that these victims drank arsenic wine and were poisoned to death. When Qin Jing Gong took his ministers, servants and soldiers with him to the grave, he was following a thousand-year-old Chinese tradition. Only 300 years later, the first emperor ... The most powerful ruler in China’s history ... Also buried officials, servants, entertainers ... And 8000 soldiers ... In his tomb. But they were all made of clay. What changed in those 300 years? According to author Guo Xingwen, the ancient Chinese may have believed in human sacrifice... But that didn’t mean they liked it. Today, we regard this as an inhumane thing. In ancient times, it was considered inhumane as well. Most of the court officials weren’t willing to die. But they didn’t have any choice, since they would have been disloyal if they didn’t. The ritual system required them to die ... It would be their honor to follow the monarch, despite the fact that none of them would really like it. But it was the violence of war that put an end to the practice of human sacrifice. Less than sixty-five years after Qin Jing Qong’s funeral, China’s seven kingdoms plunged into war. Known as the period of warring states, it lasted more than 250 years. As generation after generation was wiped out, and populations declined by the thousands, sacrificing hundreds of people for the afterlife became an unaffordable luxury. At that time human life became more important ... As a consequence of years of war, the population had decreased significantly. Each state was struggling to maintain its population, since population means productivity. By the time the first emperor ended centuries of war and unified China, human sacrifices were rare. And rulers were substituting more humane ways of providing for their afterlives. Zhang Zhongli: In a tomb about three hundred years older than the first emperor, we found small pottery figurines some tens of centimeters high. This shows that pottery figurines were replacing living beings as burial objects. From that point on, tombs which we found had more and more stuff of this kind. But nothing on the scale of the terra cotta warriors. The first emperor inherited the tradition of tiny tomb figurines ... but took it to new heights, literally. His tomb figures were life-size ... And no two of them seem alike. ... All appear to be different. Some believe the 8000 clay warriors are all individuals ... But no one has ever confirmed that. In Wellington, New Zealand, facial recognition expert Glen Cameron is about to use modern technology to analyze the ancient warriors. It’s been used throughout Asia and around the world in various forms. In border control, surveillance, immigration, and by the police. We can match around 1 million faces per second. So we’re very proud of it, and we think it’s gonna do a good job at today’s mission. The software analyzes the faces of about 100 terra cotta warriors ... Instantly comparing eyes, noses, mouths and other significant features ... to determine if any match. Let’s have a quick look at these top matches here. These two with the big fatter chins. So here we have very similar chin lines with the big thick chin. Similar mouth position. Nose slightly different, but the eyes, eyebrows very different. There is a huge range of faces here. Very individual, very individual. Whole head very different in shape. Facial hair. Very different facial hair. A lot of difference in the eyes. This guy is looking quite sad. Look at the eyebrows on this one. Nearly frowning. Very entertaining facial features in the eyes, in the eyebrows. This one here quite a flat nose. And this one here more normal. There is some similarity between the warriors like some chins, the mouth, the nose. But they are all very unique. I think this is incredibly exciting and I am astounded they could be produced this these sort of numbers and made so, so individual. It is a mystery whether they were portaits of the emperor’s soldiers or products of the warrior-makers’ imaginations. Creating 8,000 clay individuals made the job of producing the terra cotta warriors even more difficult. Human-size statues are definitely harder than small statues to make. Whoever came up with the idea might not have known how difficult making them was going to be. And all of them beautiful and realistic enough to please the imperial eye. Each one, different from the next. And the emperor demanded perfection. Day one of terra cotta warrior production ... Around 221 BC. Two men can shed light on what it must have been like to face the challenge of making life-sized soldiers out of clay. Zhang Binruo ... And Han Ping Zhe ... Make terra cotta warriors for a living. It is a thriving business that sends warriors across the world, to people fascinated with the first emperor’s army of clay. Our Terra Cotta Warriors are exported to countries like the United State, Germany, Japan, United Kingdom, and France. We manufacture around 50,000 small terra cotta warriors each year, and about 200 full-size figures. This warrior is playing golf. We made it for our client, the Yajian Golf Club. The golf club gives it to winners as a trophy. After more than twenty-five years in the replica business, Zhang Binruo and Han Ping Zhe have faced the same difficulties the original warrior makers did. Like their ancient predecessors, they’ve had to figure out warrior-making step by step, through trial and error. And just like ancient times, the problem is one of scale. We started to make 40cm, 50cm, and finally like this one, one half of human size, about 1 meter tall. Tourists wanted even bigger size, we went through many difficulties. The first challenge was simply choosing the right material. Bricks or a tomb figurine can be made out of just about any clay. But a typical terra cotta warrior stands nearly 7 feet tall and weighs up to 650 pounds. Using the right material can mean the difference between a fierce warrior and a pile of broken pottery. The right clay must be dense and sticky enough to hold together as it loses water and dries out. ... But not so dense the inside of the statue cannot dry. Today, as it was 2000 years ago, success depends on finding a clay that’s tough enough to make a life-sized warrior. Zhang Binruo didn’t have to look far for the right clay that could stand up to the job. The site is near the emperor’s tomb and his warriors. This is called red clay, it is sticky and strong. We searched many places and could not find anywhere else with this much red clay. But we find that this place has a lot. Now we only use red clay from here to make terra cotta warriors. 2000 years ago, I think Terra Cotta Warriors were impossible to be made with other soil or clay. For the first emperor’s craftsmen, finding the right clay would have solved the first big challenge of making a life-size warrior. How to make thousands of them. The first emperor died in 210 BC ... Only eleven years after he ordered his terra cotta army. His craftsmen managed to finish 8,000 warriors in just 11 years, producing more than 700 per year. … not even a third of what the ancient sculptors produced. But from something they once held in their hands. He makes replicas of ancient Chinese crossbows ... Like the ones once held by some terra cotta warriors. Even today, the hardest part is casting the crossbow’s metal trigger ... A challenge that’s made Yan deeply respectful of the men who made those triggers 2000 years ago. We found one trigger at one city, and another trigger at another city that is 2000 miles away. Parts of the trigger are exchangeable. In modern terms, these are standardized parts. I don’t know how they designed these parts. Even now this is not an easy job, even experienced artisans need to work carefully. Archaeologist Liu Zhangcheng is an expert on the weapons found with the terra cotta warriors. We found more than 30,000 arrowheads in the pits. We tested the arrowheads, and found the difference in their sizes to be less than 1cm; some of them only have a difference of 0.22mm. The difference is very tiny. We know that weapon manufacturing was standardized. And so did his warrior-makers. Archaeologist Yuan Zhong Yi has identified their names. In each of the figurines you can find the name of the craftsperson in the most hidden places. They did this in hope that people wouldn’t see their names. Signing their work meant they weren’t anonymous. But it seems they didn’t have a choice. This is to allow their managers and superiors to check their work. If things are not constructed well, the worker may be asked to re-craft them or, in the worst case scenario, go to jail or be decapitated. And knowing that the likely alternative to success was death. Both would no doubt have helped them solve the immense problem of making 8000 life-sized figures in just over 10 years. After years of trial and error, modern replica makers have learned there’s only one way to mass-produce large clay statues quickly..
... And then fire all the pieces separately in the kiln. The replica makers now know that if they make a whole statue, it will collapse under its own weight before it dries ... Or fill with hot air and explode in the kiln. Because we mass-produce, making hundreds or thousands copies of one statue, moulding is the only way. And that’s not just his opinion. Archaeologists agree that 2000 years ago, the first emperor’s craftsmen knew that moulding was the key to efficient mass production. Mass production was the only way to explain the large numbers of arrowheads we found ... The difference between arrowheads is tiny. I think they used moulds, so they were able to produce massive amounts of arrowheads with tiny differences. It would appear the ancient warrior-makers may have met the mass-production challenge by using moulds ... Just like modern warrior-makers do. Nothing suggests the ancient craftsmen used molds. This ... Broken half body gives us very important information about how terra cotta warriors were made. We can see the internal traces of the clay layers here, which shows how the clay coiled up. The sign of how the clay coiled up and joined together is very clear. Here is one clay coil, here is another clay coil. One coil after another, until the clay layers were all joined up inside the body. So, this is how a terra cotta warrior is made. The ancient evidence leaves no doubt: the original terra cotta warriors weren’t stamped out of moulds. The ancient craftsmen used a simple method; they pounded the clay until it became soft, and rolled the clay into strips. Then they coiled the clay strips upward, we call this method clay-coiling ...the first emperor’s craftsmen were the first people in China to make statues this way. Coiling was a difficult way to make more than 700 statues a year. With replica maker Han Ping Zhe and his master craftsmen. When we opened our business, we weren’t sure how to make a terra cotta warrior. I read about the traditional clay-coiling method. And we tried it. It took us a month to finish one statue. But only half an inch thick... That won’t collapse under its own weight, a danger that grows greater as the coiling goes higher. Supporting the figure with wooden sticks helps. But the only real solution is to stop and let the clay dry over and over again before making the statue taller. They must find a delicate balance between waiting long enough for the clay to dry but not so long it dries out and cracks. When I looked at the terra cotta warriors, I was amazed by the ancient people’s achievement. My statues collapsed 3 or 4 times when I first started. Coiling one can take as long as a month. But there was a reason the first emperor’s craftsmen chose the more difficult method. …the craftsmen weren’t making the same statue over and over. They were making 8,000 unique ones. If these statues were made with moulding, it would only be efficient if we made the same copy over and over again ... This was not the goal of the ancient people. With the clay-coiling method, it is easier to make each terra cotta warrior different, whether it was fat or slim, tall or short ... The idea was to create a group of humans. But if coiling made more sense for individualizing the warriors, it was still a slower process. There was only one way to increase the number of statues produced. And the first emperor knew it. Archaeologists have found 87 different names stamped on the terra cotta warriors ... So 87 master craftsmen must have been in charge of making them. Coiling one statue every month, each team could have finished 12 warriors every year ... And all 8,000 in only 8 years. But today’s replica-makers know that having a huge labor force wouldn’t have solved yet another difficulty. A problem that could have destroyed the production schedule... And their statues. In northern China, winter temperatures plunge below freezing ... While in the summer, they soar into the 90s. Both extreme cold and extreme heat will ruin clay statues before they can harden. From long experience, I think the coiling method that was used 2000 years ago could not have been done at such temperatures. Ideally the temperature needs to be maintained at around 20 degrees celsius. Without the benefit of modern heating and cooling systems, the ancient warrior-makers faced a stark choice: find a way to keep their workshops at 68 degrees all year round... Or stop work for six months of the year. No one knows for sure what they did. But replica-maker Zhang Binruo has his own theory. Cave houses ... Dug out of hillsides by farmers living near the first emperor’s tomb. Warm in winter, cool in summer, they’re ideal places to live while tending crops. Zhang believes that 2000 years ago, they were also ideal places to make terra cotta warriors. In the summer, the temperature outside may reach 30 Celsius degrees; inside the cave house, it may be only 20-25 Celsius degrees. In the winter, outside may be-10 Celsius degrees, while the cave-house remains at 15-20 Celsius degrees. They sculpted the terra cotta warriors in cave-houses, then fired the statues after sculpting by sealing the entry of the cave-house and turning it into a kiln, so they could fire the statues inside. Today’s warrior makers’ struggles provide insight into the immense challenges facing the creators of the clay army. Sculpting 8,000 warriors in just over a decade ... No two of them alike ... Without having done so before. But evidence also shows there was far more to producing the statues than simply sculpting them. To satisfy their emperor, the ancient warrior-makers had to meet one more challenge. What they’ve discovered has delighted some ... And stunned others. After more than thirty-five years, experts have learned a great deal about restoring the terra cotta warriors. But they’re still unable to prevent an archaeological tragedy. But those colors vanish within a week ... Sometimes minutes ... After excavation. Conservation expert Zhou Tie and his team race to save what they can, working on newly-excavated terra cotta warrior fragments... Fresh from the ground after more than 2000 years. When people created the terra cotta warriors 2000 years ago, all the pits were full of color ... When we excavated, the paints were almost gone ... Only small areas of paint remained, and those were in poor condition. The paint can easily fall off after excavation. For years, an international alliance of experts from China and Germany has battled to save the terra cotta warriors’ colors. But at least they’ve identified the enemy. That was one of ancient China’s most coveted treasures. Every one of the 8,000 terra cotta warriors got a coating of lacquer from head to toe. Lacquer is a very stable material and also in the antiquity they knew that it can survive centuries or even longer. ... So it had technical reasons, but also aesthetically reasons and reasons of meaning. Lacquer was, and still remains, a valuable substance. 2,000 years ago, it was the ancient world’s plastic ... A hard resin that protects whatever it covers from decay. And when it dries, its brown color transforms into a glossy sheen nothing else could equal. Lacquer wares were luxury goods and they probably were so expensive that only the emperor could afford to lacquer a whole army. For the ancient Chinese, its value was derived from more than just its strength and beauty. It was also difficult to obtain. The sap of the lacquer tree can’t be harvested until the tree is six years old. And even then, only from June to September ... When the weather is warm. Some experts believe it would have taken the sap of 25 trees to lacquer just one terra cotta warrior ... And as many as 200,000 trees to finish all of them. That’s because lacquer harvesters can take only about 10 grams of sap from each tree ... Just enough to fill an egg cup. You can't take very much because otherwise the tree will die. So you do it once, let it heal, and then continue. The lacquer trees aren’t the only ones at risk. Lacquer trees are related to poison ivy and poison sumac. Touching the sap or even just breathing its fumes can cause extreme discomfort. It's not painful. It's just itching and you have to um control yourself a lot not to scratch. [laughter] and it's not really looking nice. And what normally happens is that you get this reaction several times and then there's an immunization, so afterwards you don't get it anymore. Or so she thought. Breathing lacquer fumes during this interview triggered another reaction two days later. The first emperor’s workers were forced to expose themselves to poisonous lacquer on a daily basis. 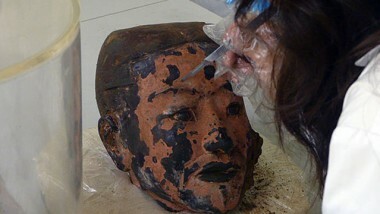 And 21st-century researchers must now work with the toxic sap so they can save the colors on the terracotta warriors. Until it curls up and separates from the clay ... taking paint with it. And finally the lacquer layers just flake off in tiny flakes and then there's no chance to bring them back to the terra cotta. The only solution is to keep the lacquer moist so that it will stay attached to the terra cotta. Its water must be replaced by something that won’t evaporate. One group of German scientists has tried coating warrior fragments with a plastic used to seal underground water pipes. Then bombarding the plastic with electron beams from a particle accelerator ... Which evaporate water and bond the plastic to the lacquer. But that can’t be done by archaeologists in the field ... Who may have only minutes to save a painted warrior. We hope that we’ll find a method that is simple and cheap, easy to apply during the excavation and that helps preserve the lacquer layers in the first moment. While saving the warriors’ color seems difficult, reconstructing what they originally looked like may be an even greater challenge. The only clues are faded fragments of terra cotta ... Bits of paint found in soil ... And decades-old excavation reports. But now, visitors to a Munich museum can see what the terra cotta warriors may have looked like. After years of painstaking research, Catharina Blaensdorf and her colleagues have painted two warrior replicas as they believe they looked when they were finished more than 2000 years ago. Many people were astonished or surprised because they didn’t expect them to be so colorful, and some people were also really shocked, because somehow they just liked the terra cotta version ... And they found it’s kind of disturbing and braking it up. And they really asked me, they asked me, “are you really sure that it has to be like this?”... It’s based on our findings so we’re pretty sure that this is true, and they just have to get used to it ... And we tell them that of course we are not going to repaint the originals (laughs). But there are even more complex mysteries surrounding the warriors. When they analyzed surviving color fragments, conservation experts made an unexpected discovery. One of those ancient colors differed from the others. Known as Chinese purple, it has unique and surprising properties. Halfway around the world, researchers at Stanford University are using the world’s most powerful x-ray machine to study those properties. Zhi Liu, Apurva Mehta, and Nobumichi Tamura are all physicists ... But they’ve set out to solve an archaeological mystery. We’re looking at one clump of the Chinese purple pigment and the size is around 50 micron to 50 micron. So it’s about your, the cross section of your hair. From a very tiny sample you can tell very big story. Chinese purple is one of only two entirely man-made colors produced anywhere in the world before the birth of Jesus. The other was Egyptian blue ... Created by chemists working for the pharoahs thousands of miles from China ... And centuries before the silk road opened up trade between China and the west. People speculate there is a technology transfer from Egypt to china because of the similarity of those two materials ... Which is really significant in terms of technological development and the communication between two civilizations. Stanford’s powerful x-ray machine confirms that Chinese purple and Egyptian blue shared all the same ingredients... With two exceptions. Egyptian blue contains calcium ... While Chinese purple has barium in it. And the Chinese also added something the Egyptians never used ... Lead oxide. It ... Indicates that the Chinese really actually invented the Chinese purple completely independently from the Egyptians there was no technology transfers at all. And that told us that the technology they used for forming this material was very unique. If it wasn’t brought from Egypt, that means the Chinese created the pigment using their own methods. The team believes those methods were not developed for art or science… but for religion. This burial suit was made for a Chinese leader who went to his grave not long after the terra cotta warriors went to theirs. A suit made of thousands of pieces of jade. They paid alchemists to find a formula for making jade. The alchemists created a jade lookalike called “Chinese glass,” made with barium and lead: The two key ingredients of Chinese purple. As they searched for the secrets of immortality, did they also create Chinese purple? Chinese glass and Chinese purple have nearly identical chemical compositions ... And their apparent connection doesn’t end there. Around 250 AD ... Some five hundred years after the terra cotta warriors were made ... China’s religious beliefs began to change. People no longer buried themselves in jade to make their bodies immortal. Chinese glass disappeared. And Chinese purple vanished at exactly the same time ... It was never made again. It would seem Chinese purple has a sacred past. Fitting for warriors meant to accompany the emperor into the afterlife. And across the United States, another powerful scientific tool has revealed that Chinese purple’s potential might lead to fantastic technological breakthroughs. In Tallahassee, Florida, scientists have discovered that the terra cotta warriors’ purple paint is much more than just a beautiful color. It packs 45 teslas of magnetic force. Facility director Eric Palm has a simple way of showing what 45 teslas can do. It’s dangerous enough that we don’t typically allow people that have not been trained to be around the magnet. We don't allow people to bring tours where they can see the magnet, just in case something bad happens. Scientists from around the world, like Suchitra Sebastian of Cambridge University, use the magnet in their research. The 45t hybrid’s power will force the material to reveal its hidden physical properties. In 2006, Suchitra Sebastian and Neil Harrison put a few flakes of Chinese purple into the magnet’s core, and saw something astonishing. Inside the magnet, the molecules of Chinese purple became a single magnetic wave, a unique state in the world of quantum physics. And the magnetic wave lost its third dimension... separating into individual two-dimensional planes. Well when I first saw this I was just in disbelief. It was a big surprise, I mean it was a totally new type of discovery. A discovery that might change the world. And better superconductors could mean more efficient magnetic trains ... Lower electricity bills ... And faster computers. It’s incredible to think that this material that’s been around for more than 2,000 years, that was initially discovered and in fact created by Chinese chemists and has been on this terracotta army for 2,0000 years. It’s incredible to think that we’ve re-visited this material, something that’s a fundamental advance in our understanding, in our 21th century knowledge of physics. And thats just mind blowing. And there may still be other mysteries concealed within this ancient army. Today, scientists are revealing just how brilliant that achievement was. And searching for other mysteries hidden within these ancient masterpieces. © 2011 WNET.ORG PROPERTIES LLC. A NATURAL HISTORY NEW ZEALAND LTD PRODUCTION FOR THIRTEEN IN ASSOCIATION WITH WNET.ORG AND NATIONAL GEOGRAPHIC CHANNEL. WHICH ARE SOLELY RESPONSIBLE FOR ITS CONTENT.